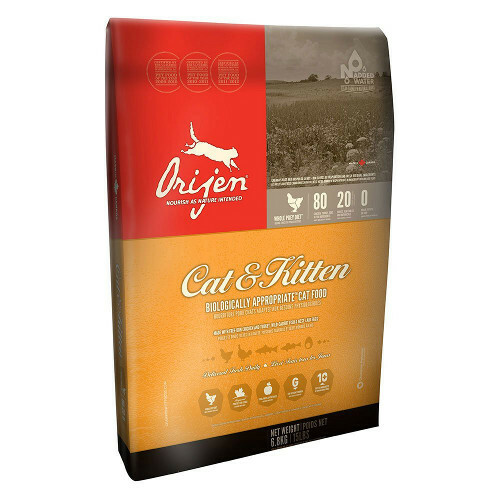 Orijen Cat Food is now 80/20 formula! Meaning that 80% of each bag is meat and 20% is other essential ingredients. Orijen maintains all their core concepts of Grain free, high quality natural ingredients and only using free range proteins. The first 5 ingredients are fresh (never frozen) meats, perfect proportions of nutrients and the over-all taste and digestibility is improved. Orijen products are made in small batches from ingredients that are natural and about half of the ingredients arrive fresh each day. Orijen does not use chemical preservatives or artificial coloring. The amount of fresh meat that is used, give the kibble a unique shape, smell and color. There are added protein sources to each formula to give more taste and nutrients to the formulas. Fresh meats are low in calcium and phosphorus, which helps make each formula balanced. Boneless chicken*, chicken meal, chicken liver*, whole herring*, boneless turkey*, turkey meal, turkey liver*, whole eggs*, boneless walleye*, whole salmon*, chicken heart*, chicken cartilage*, herring meal, salmon meal, chicken liver oil, chicken fat*, red lentils, green peas, green lentils, sun-cured alfalfa, yams*, pea fibre, chickpeas, pumpkin*, butternut squash*, spinach greens*, carrots*, Red Delicious apples*, Bartlett pears*, cranberries*, blueberries*, kelp, licorice root, angelica root, fenugreek, marigold flowers, sweet fennel, peppermint leaf, chamomile, dandelion, summer savory, rosemary, Enterococcus faecium . SUPPLEMENTS: Vitamin A, vitamin D3, vitamin E, niacin, riboﬂavin, folic acid, biotin, vitamin B12, zinc proteinate, iron proteinate, manganese proteinate, copper proteinate, selenium yeast. ME (calculated metabolizable energy) 4060 kcal/kg (500 kcal per 250ml cup/120g). Calories are distributed to support peak physical conditioning with 41% from protein, 17% from fruits and vegetables and 42% from fat.